I was driving by the Sebastopol Lagoon the other morning right after the rain had stopped. I've always had a soft spot for how the big puffy clouds reflect in the still pools of the Lagoon, accented by stately trees and a variety of vibrant green plant life. I found a good vista point and captured about 30 frames. I was thinking that one of these might make a nice 13 x 19 inch enlargement. Unfortunately, I made a bonehead mistake by shooting the series with the white balance set on “custom” from the night before. Fortunately, I record in Raw, so I was able to correct the blunder quickly during post production in Aperture. I began my path to redemption by selecting the “Daylight” white balance preset that I had created previously in the Adjustments HUD, then applied it to the first image in the series. With the photo still selected, I used Shift-CMD-C to copy my adjustment. Then I selected the other images in the series and used Shift-CMD-V to add the Daylight white balance setting to them. Within just minutes, I had corrected an otherwise disasterous mistake that would have ruined my day back in the “Jpeg/destructive editing” dark years. Now I'm off to the printer to see how these shots look on paper. 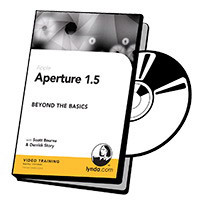 PS: You can learn more about Aperture by checking out the Lynda.com training video I authored with Scott Bourne titled, Aperture 1.5: Beyond the Basics. Boy, it is really nice to hear that a pro still occasionally makes mistakes like this!